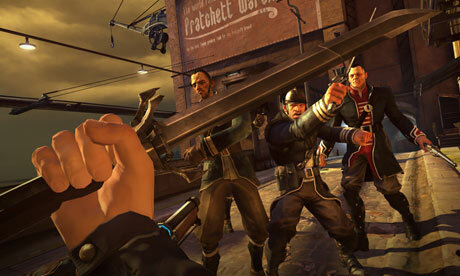 Dishonored is a first-person stealth action based video game. It was released on October 9, 2012 in North America. The story starts in the industrial city of Dunwall, you are Corvo Attano the bodyguard of the Empress and her daughter. And of course you are the best bodyguard. With your legendary skills, you’re all set to become a badass assassin. As soon as you get back from your “mission”, you go see the Empress and as you are talking you get attacked by assassins that kill the Empress and kidnap their daughter. Big shocker, unless you can predict the future. If you do, help the world or something. Of course, you are now charged of murdering the Empress and hiding her daughter. So as your execution approaches while you rot in prison you receive a letter from an anonymous friend who helps you escape. Supposedly, the end of the game changes based on your playing-style. It is possible to win the game without killing anyone, just by finding alternate ways of getting the wanted information and making sure the targets don’t harm anyone any more . But I can tell you right now, beating the game without killing will be extremely hard, you have to go unseen for incredible amounts of time which can be frustrating. If any guard catches a glimpse of you he is going to attack you and security is going to be boosted for the whole place. Also, you have to admit killing someone from the shadows is extremely fun. Hearing guards ask themselves why no other guard is doing rounds around a place is really funny. But that is just my take, you try to be all goo and stuff and tell me how fun it is. The stealth system is well-done, if you kill someone and a guard sees you but you teleport elsewhere he will be alarmed and search for you everywhere. And guards are not stupid, in most stealth games, after a certain amount of time the guard will just think it was the wind, even if there’s a dead body in front of him. In Dishonored, I went inside a building for 20 minutes, hoping that when I came out their little tiny memories would have forgotten about the body they are looking at. I was wrong. They remember and look for you unless you hid the body. It will challenge your patience because you will have to be waiting for the right moment. And those moments will be so short that you better be prepared to bolt into action and then disappear into the shadows before anybody sees you. The “skills” system is also well done, you don’t have to spend a lot of points to max out a skills since they only have two levels. You can actually see the difference of maxing out a skill point so you get a sense that it is useful. After all that, I must admit that I am not far into the game yet. Is it fun? Yes. Will I finish it? I can’t wait to see how bad I made the world with all my killing. If you love stealth games, Dishonored will be wonderful. You will feel like the most badass assassin anybody has ever heard of. If you just want to shoot stuff and punch things around, you can do that too but you will not be enjoying the game at its fullest. With these short words I will now go and keep on playing this great game and hope that at the end I will feel just as positively about it than I do right now. This entry was posted in Reviews and tagged assassin, attano, bethesda, bodyguard, corvo, dishonored, dunwall, empress, first-person, guards, mask, skills, stealth, teleport. Bookmark the permalink.